Snouted Cobra​ [​Naja annulifera]​ previously referred to as the Egyptian cobra but the species was split into two completely separated species. Snouted Cobra​ [​Naja annulifera] occurs in Limpopo, North West, Northern Gauteng and Northern KwaZulu-Natal. It is also found in Southern Mozambique, Eastern Botswana and Zimbabwe. Egyptian cobra [Naja haje] is found Morocco, Eastwards to Egypt, South to Tanzania westwards and Central Africa. Snouted Cobra’s​ ​occour in two forms typically: Plain phase: light to dark brown/yellow with uniform colour and banded. Snouted Cobra [Naja annulifera] occurs in Limpopo, North West, Northern Gauteng and Northern KwaZuluNatal. It is also found in Southern Mozambique, Eastern Botswana and Zimbabwe. 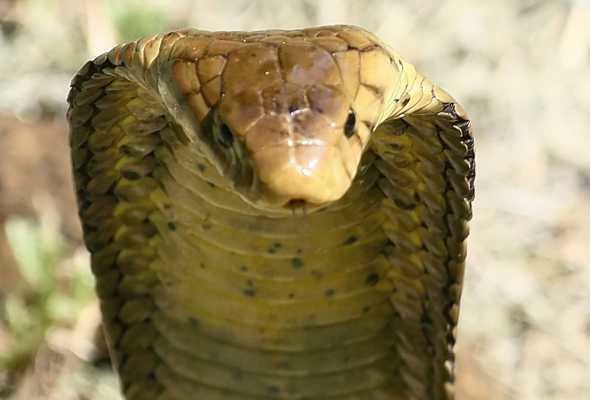 The Egyptian Cobra venom is a potent neurotoxic type. Snouted cobra’s are known to feed on a wide variety of prey include: small mammals, birds, frogs, lizards (especially monitor lizards) and other snakes including venomous species like Mozambique Spitting Cobra’s and puff adders will be taken. The Snouted cobra is a large robust snake, which can be found in arid savanna, wooded areas where they often take refuge in trees as well as along river beds. They do not spit/spray their venom. When threatened will stand their ground and spread an impressive hood to ward off predators, failing that these snakes will strike out and bite.